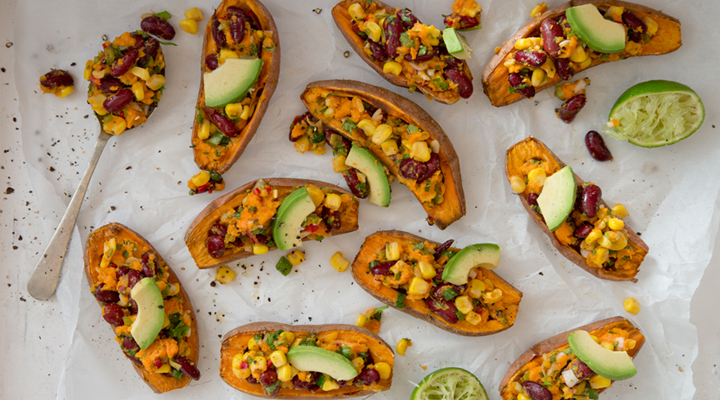 Crispy sweet potato skins with aromatic salsa-style beans topped with avocado and lime make for a really tasty, easy dinner. This short and snappy dish requires very little prep time and will soon become a regular weekly meal, as it really delivers on taste and all the family will enjoy it. Cut the ends off the sweet potatoes, then cut the potatoes in half. Place them on a baking tray, cut side up, and roast for 50 minutes to 1 hour, until a fork inserted into the flesh comes out easily and they smell amazing! Holding the halved sweet potatoes in a tea towel, use a spoon to scoop out the flesh into a large mixing bowl. Try to leave a thin layer of flesh around the skin, though, so that the skin can stand up on its own. Place the skins back on the baking tray and return to the oven for a further 10 minutes to allow the skins to get nice and crispy. Meanwhile, mash the scooped-out sweet potato flesh. Add the kidney beans, corn, coriander, spring onions, garlic, chilli, lime juice, cumin, paprika and a pinch of salt and pepper and mix all the ingredients thoroughly. Remove the potato skins from the onion and divide the filling evenly between them. Use a spoon to scoop the avocado out of its skin, then cut into slice. Top each sweet potato with slices of avocado and serve straight away. Yummy, kids loved it, added an ounce of grated cheese to the filling. Skins were nice and crispy.